Body: Brown or Hare's Ear Raccoon. Most tiers now use rabbit. 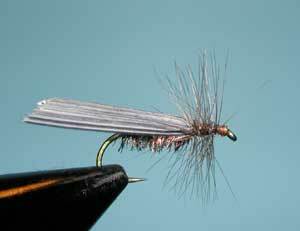 Notes: Wayne "Buz" Buszek created this fly in the 1950's while fishing the Kings River and trying to match the caddis fly hatch that was taking place below Pine Flat Reservoir. Buz tied turkey wing by its tip to the front shank of the body since the wing was more resistant to splitting in this manner. 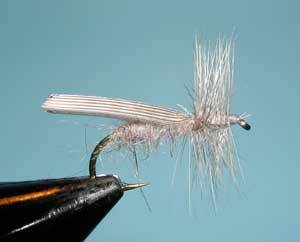 The hackle was undersized to enable the fly to sit low in the water and keep the wing parallel to the surface. The success of the fly became well known during the 1960's when Orvis included it in their catalog and many flyfishing books began to mention it. Buz maintained a flyfishing store in Visalia, CA. The Federation of Fly Fishers honored Buz by creating the Buz Buszek Memorial Award in 1970 which is awarded annually to an outstanding fly tyer demonstrating skill, innovation, and the sharing of knowledge in the art of fly tying. The Kings River Caddis works best on slow moving waters. It represents the spotted sedges, Hydropsyche, that Buz had spotted on the Kings River below Pine Flat Reservoir.The pattern is also the basis of other Quill-Wing Caddis variations, sometimes referred to as "Tent Caddis" patterns. 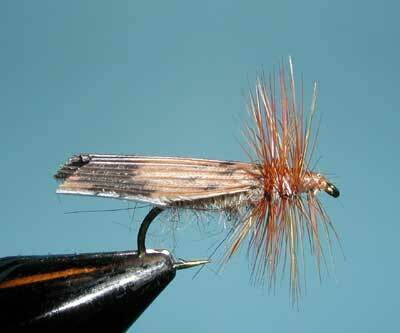 The Gray Quill-Wing Caddis is used for small grannoms and brachycentridae. 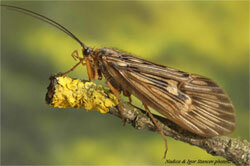 The Olive Quill-Wing Caddis represent gray sedges, Rhyacophila. 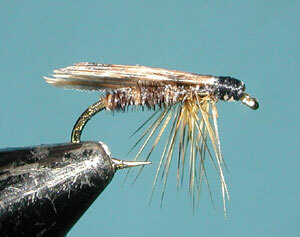 A popular version, Tent Caddis, is one that is commercially tied with the hackle clipped on top and the wing mounted over the hackle.